Ohio Wesleyan junior Tristin Tillman tries a scoop-shot in the Battling Bishops’ 72-67 win over DePauw in NCAC play Saturday afternoon at Branch Rickey Arena. 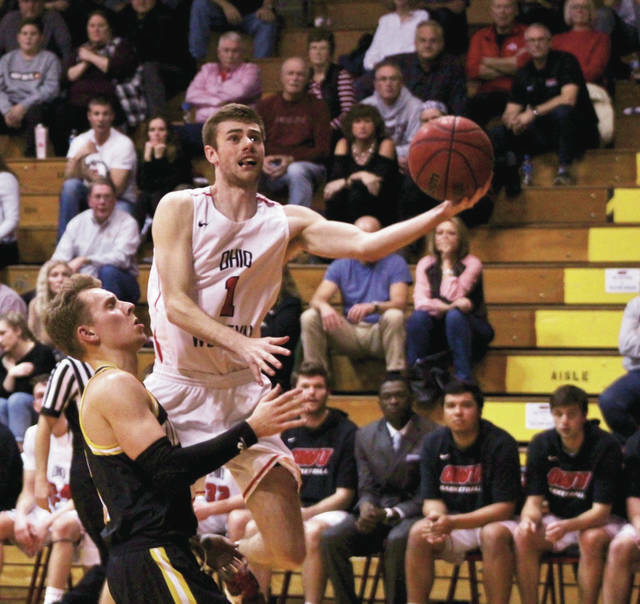 DELAWARE – The Ohio Wesleyan men’s basketball team leaned on its defense after letting go of a lead it maintained for most of the game. The Battling Bishops came up with four steals and a pair of blocks on defense and turned it into a 12-0 run to take the lead on their way to a 72-67 win over DePauw Saturday afternoon at Branch Rickey Arena. Nick Carlson hit a 3-pointer on one end and then came up with a steal on the other to start the go-ahead rally with just under 5 minutes left in the game. Ethan Stanislawski added a pair of free throws to cut the deficit to 59-57. Gabe Johnson had a pair of steals sandwiched around a Stanislawski block to keep the deficit at two. “We were just much more active at that point,” DeWitt said. Then, Carlson fed to Stanislawski for the go-ahead 3 to give the Bishops a 62-59 lead with 2:41 remaining. Grant Gossard added a dunk and a layup on OWU’s next two possessions before it became a free throw game down the stretch. Gossard was held scoreless to that point after putting up nine of the team’s first 16 points. Carlson added an old-fashioned 3-point play to push the lead to 19-8 with 11:26 left in the first half. A Stanislawski 3-pointer pushed the lead as high as 16 before the Tigers closed the half 7-2 to cut it to 38-27 at the break. Cole Jenkins knocked down a couple of 3s and Matthew Godfrey hit a third to pace DePauw’s 21-6 run. Jenkins’ second triple put the Tigers ahead for the first time at 48-47 with 12:14 remaining. A Johnson 3-pointer tied it 52-52 with 8:20 left, but Jenkins answered with one of his own to start a 7-0 Tiger rally that led up to the final sequence. Stanislawski scored a game-high 23 points and Gossard and Carlson added 15 apiece to lead the Bishops. Gossard pulled down 11 rebounds and had four blocks, Jaret Gerber had five assists and Johnson had three steals to lead the Bishops (12-11, 7-9). Nolan Ginther led the Tigers with 22 points and eight boards. Jenkins added 11 points, Felke also grabbed eight rebounds and dished out four assists to lead the Tigers (15-8, 9-7). Claire Keefe and Maya Howard scored four points each before Maeve Summerville capped the early rally with a 3-pointer to give the Tigers a 19-9 lead with 1:28 left in the first. DePauw led by as many as 14 in the first half before blowing it open with an 18-7 third quarter and rolled from there, clinching at least a share of the league title with the win. Sydney Kopp poured in 23 points; Keefe added 19 points, seven rebounds and three blocks; Howard finished with 15 points and seven assists; and Mya Shannon chipped in 11 points to lead the Tigers (19-4, 13-1). DePauw put on a dominating display on the boards, winning the rebound battle 45-16 and scoring 20 second-chance points. Four players finished six or more rebounds, including Kopp, Campbell Montgomery and Sadie Jurkovic – who had six apiece. Cierra Joiner had 15 points, eight rebounds and a couple of steals; Erin Delaney added 12 points; Leah Maniaci chipped in nine points; and Claire Sterling had eight points and three assists to lead the Bishops (10-13, 5-9). Next up, both the men’s and women’s teams travel to Gambier to take on Kenyon Wednesday night in NCAC action. The women’s game will start at 6 p.m. and the men’s game will follow at approximately 8 p.m.
https://www.delgazette.com/wp-content/uploads/sites/40/2019/02/web1_tillman.jpegOhio Wesleyan junior Tristin Tillman tries a scoop-shot in the Battling Bishops’ 72-67 win over DePauw in NCAC play Saturday afternoon at Branch Rickey Arena.